The Kennedy Space Center is included in the basic version of Orbiter. There are also a number of addons available. Merritt Island and Kennedy Space Center (shown in white). The John F. Kennedy Space Center (KSC) is the NASA space vehicle launch facility (spaceport) near Cape Canaveral on Merritt Island in Florida, United States. The site is midway between Miami and Jacksonville, Florida. It is 34 mi long and around 6 mi wide, covering 219 mi². Around 17,000 people work at the site. There is a visitor center and public tours and KSC is a major tourist destination for visitors to Florida. Because much of KSC is off limits to development, the site also serves as an important wildlife sanctuary, with only 9% of the land developed. Operations are currently controlled from Launch Complex 39, the location of the Vehicle Assembly Building. 4 mi to the east of the assembly building are the two launch pads. 5 mi south is the KSC Industrial Area, where many of the Center's support facilities are located and the administrative headquarters. Kennedy Space Center's only launch operations are at Launch Complex 39. All other launch operations take place at Cape Canaveral Air Force Station (CCAFS) which is operated by the U.S. Air Force. 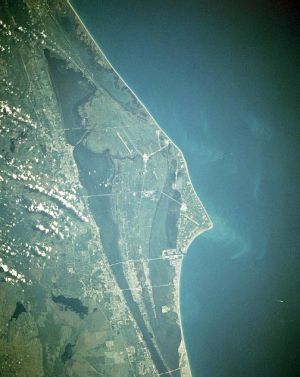 Cape Canaveral Photo from space. The area had been used by the government since 1949 when President Harry Truman established the Joint Long Range Proving Grounds at Cape Canaveral to test missiles. The location was ideal for this purpose as it allowed for launches out toward the Atlantic Ocean, and it was closer to the equator than most other parts of the United States allowing for rockets to get a boost from the earth's rotation. In 1951 the U.S. Air Force established the Air Force Missile Test Center at nearby Banana River Naval Air Station. Following the USSR's launch of Sputnik, the first orbiting satellite, the U.S. Navy's Vanguard blew up on December 6, 1957. NASA was founded in 1958 and the site was transformed into a major launch site. Redstone, Jupiter IRBM, Jupiter-C, Pershing, Polaris, Thor, Atlas, Titan and Minuteman missiles were all tested from the site, the Thor becoming the basis for the expendable launch vehicle (ELV) Delta rocket, which launched Telstar 1 in July 1962. The announcement of the lunar program led to an expansion of operations from the Cape to the adjacent Merritt Island. NASA began acquisition in 1962, taking title to 131 mi² by outright purchase and negotiating with the state of Florida for an additional 87 mi². In July 1962 the site was named the Launch Operations Center. It was renamed the John F. Kennedy Space Center in November 1963, after the recently assassinated president John F. Kennedy. 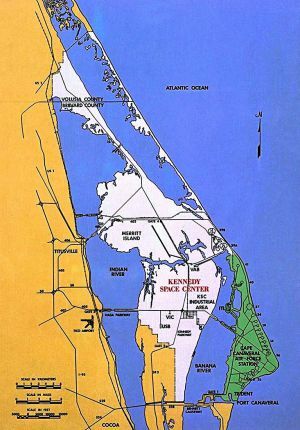 The surrounding Cape Canaveral was also renamed Cape Kennedy, but this change was unpopular with the local people and the name reverted in 1973. The lunar project had three stages—Mercury, Gemini and Apollo. The objective of Mercury was to orbit and retrieve a manned Earth satellite. The project started in October 1957 using the Atlas ICBM as the base to carry the Mercury payload. but early testing used the Redstone rocket for a series of suborbital flights including the 15-minute flights of Alan Shepard on May 5 and Virgil Grissom on July 21, 1961. The first human carried by an Atlas was John Glenn on February 20, 1962. Space Shuttle Atlantis is prepared for launch on Mission STS-36. From the knowledge gained through Mercury the more complex two-man capsules of Gemini were prepared as was a new launcher based on the Titan II ICBM. The first manned flight took place on March 23, 1965 with John Young and Virgil Grissom. Gemini 4 featured the first extravehicular activity, by Edward H. White. There were twelve Gemini launches from KSC. The Apollo program had another new launcher—the three-stage Saturn V (111 m high and 10 m in diameter), built by Boeing (first stage), North American Aviation (engines and second stage) and Douglas Aircraft (third stage). North American Aviation also made the command and service modules while Grumman Aircraft Engineering constructed the lunar lander. IBM, MIT and GE provided instrumentation. At KSC a $800 million massive new launch center was built to take this new launcher—Launch Complex 39. It included a hangar to hold four Saturn V rockets, the Vehicle Assembly Building (VAB, 130 million ft³); a transportation system from the hangar to the launch pad, capable of carrying 5440 tonnes; a 446-foot movable service structure and a control center. construction began in November 1962, the launch pads were completed by October 1965, the VAB was completed in June 1965, and the infrastucure by late 1966. From 1967 through 1973, there were 13 Saturn V launches from Complex 39. Before the Saturn V launches there were a series of smaller Saturn I and IB launches to test the men and equipment from Complex 34 on the Cape Canaveral site. The death of three astronauts by fire on Apollo-Saturn 204 (later designated Apollo 1) on January 27, 1967 occurred at Complex 34. The first Saturn V test launch, Apollo 4 (Apollo-Saturn 501) began its 104 hour countdown on October 30, 1967 and, after delays, was launched on November 9. Apollo 7 was the first manned test on October 11, 1968. Apollo 8 made 10 lunar orbits on December 24-25, 1968. Apollo 9 and Apollo 10 tested the lunar lander. Apollo 11 was launched on July 16, 1969 and the Moon was walked on at 10.56 pm, July 20. The Apollo program continued at KSC, through Apollo 14 (1971), the 24th American manned space flight (40th in the world), until Apollo 17 of December 1972. The Air Force chose to expand the capabilities of the Titan launch vehicles for its heavy lift capabilities. It constructed Launch Complexes 40 and 41 to launch Titan III and Titan IV rockets at CCAFS, just south of Kennedy Space Center. A Titan III has about the same payload capacity as a Saturn IB at a considerable cost savings. Launch Complex 40 and 41 has been used to launch defense reconnaissance, communications and weather satellites and NASA planetary missions. The Air Force also planned to launch two Air Force manned space projects from LC 40 and 41. They were the Dyna-Soar, a manned orbital rocket plane (cancelled in 1963) and the Manned Orbiting Laboratory, a manned reconnaissance space station (cancelled in 1969). 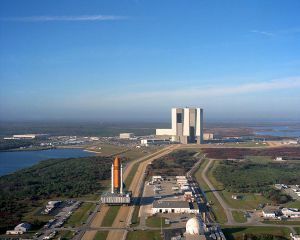 An aerial view of the Launch Complex 39 area shows the Vehicle Assembly Building (center), with the Launch Control Center on its right. ELV rocket development also continued at KSC—before Apollo, an Atlas-Centaur launched from Launch Complex 36 had put the first American Surveyor lander softly on the Moon on May 30, 1966. A further five out of seven Surveyor craft were also successfully transferred to the Moon. From 1974-1977 the powerful Titan-Centaur became the new heavy lift vehicle for NASA, launching the Viking and Voyager series of spacecraft from Launch Complex 41, an Air Force site lent to NASA. Complex 41 later became the launch site for the most powerful unmanned U.S. rocket, the Titan IV, developed for the Air Force. The Saturn V was also used to put the Skylab space station in orbit in 1973. Launchpad 39B was slightly modified for Saturn IB use, and launched three manned missions to Skylab in 1973, as well as the Apollo component of the Apollo-Soyuz Test Project in 1975. KSC was also the launch site for the Space Shuttle, reusing the Complex 39 Apollo infrastructure, as well as the landing site, with a 4.6 km runway built as the Shuttle Landing Facility. The first launch was of Columbia on April 12, 1981. Twenty-five flights had been completed by September 1988, with a large hiatus from January 28, 1986, to September 29, 1988, following the Space Shuttle Challenger disaster (which was the first shuttle launch from Pad 39B). In September 2004, parts of Kennedy Space Center were damaged by Hurricane Francis. 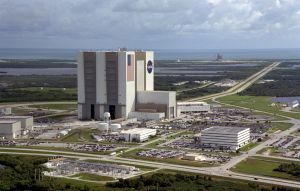 The Vehicle Assembly Building lost 1,000 exterior panels, each 3.9 x 9.8 feet in size. This exposed 39,800 ft² of the building to the elements. Damage occurred to the south and east sides of the VAB. The Space Shuttle tile manufacturing facility suffered extensive damage. The roof was partially torn off and the interior suffered extensive water damage. Tile manufacturing will probably be moved to the Palmdale, California backup facility. Further damage to KSC was caused by Hurricane Wilma on October 2005. The Kennedy Space Center Visitor Complex, operated by Delaware North Companies at no taxpayer expense, is home to a number of museums, two IMAX theatres, and various bus tours allowing visitors a closer look at various restricted areas that would otherwise not be possible. Included in the base admission is tour-bus transportation into the restricted area to an observation gantry on the grounds of Launch Complex 39, and to the Apollo-Saturn V Center. The observation gantry provides unobstructed views of both launch pads and all of Kennedy Space Center property. The Apollo-Saturn V Center is a large museum built around its centerpiece exhibit, a restored Saturn V launch vehicle, and features other space related exhibits, including an Apollo capsule. Two theaters allow the visitor to relive parts of the Apollo program. One simulates the environment inside an Apollo-era firing room during an Apollo launch, and another simulates the Apollo 11 landing. The Visitor Complex also includes two facilities run by the Astronauts Memorial Foundation. The most visible of these is the Astronaut Memorial, also known as the Space Mirror, a huge black granite mirror through-engraved with the names of all astronauts who died in the line of duty. These names are constantly illuminated from behind, with natural light when possible, and artificial light when necessary. The glowing names seem to float in a reflection of the sky. Supplemental displays nearby give the details of the lives and deaths of the astronauts memorialized. Elsewhere on the Visitor Complex grounds is the Foundation's Center for Space Education, which includes a resource center for teachers, among other facilities.